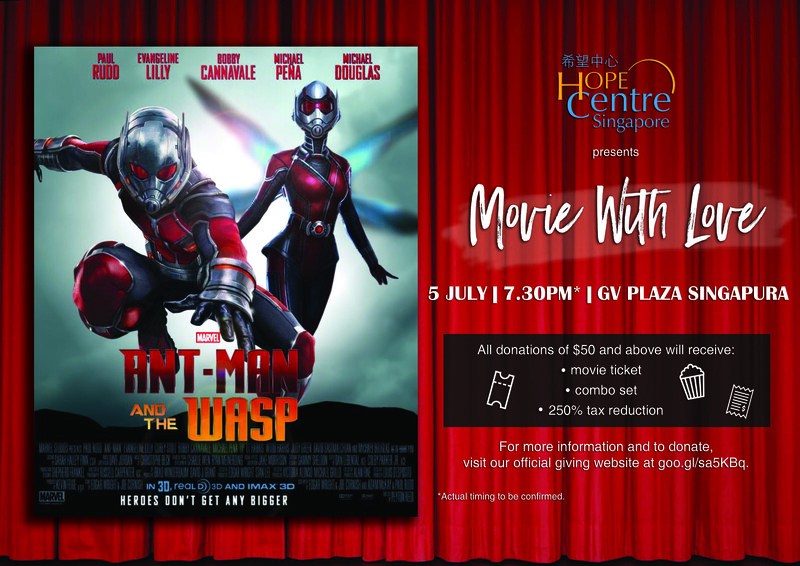 Hope Centre (Singapore) is organizing our first Charity Movie on 5 July 2018 at Golden Village Plaza Singapura! You can help improve the lives of people in need and celebrate the ‘Superhero’ within everyone by supporting this fundraising event. All donations of $50 and above will be entitled to one movie ticket and a ‘combo set’ that includes a small popcorn and drink. In addition, donations to Hope Centre (Singapore) are eligible for a 250% tax deduction. We target to raise a total of $20,000 through this upcoming event for the programmes and services that support the beneficiaries in the community, such as the needy children, youth and seniors. Your giving and support towards this event enable us to continue running programmes for more than 4500 beneficiaries in need. For more information and to donate, visit our official giving website! THANK YOU for your generous giving to our causes!